The Little Do'er has been in the business of carpets for over 40 years, so when it comes to carpets we know just about everything there is to know, which is great for you. We can help you make the right choice when it comes to choosing your carpet. Our Mobile Showrooms can visit your home and help match your preferred style and colour of carpet to your furniture and home decor. We can do a free measure and quote on the spot. Call us on 13 13 78 to make an appointment. Cut Pile comes in Plush and Twist varieties. Plush has tuft ends which blend together, creating a soft feel underfoot, where as Twist carpet lays in different directions and is more textured. Loop Pile comes in Level Loops, Sisals and Multi-level Loops. For all types, the yarn is looped to create a soft tuft suitable for children’s rooms and living rooms where comfort and practicality are key. Combination comes in Level Cut and Textured Cut varieties. The first combines loops and cut tufts and has a smooth finish. The second combines loops and tufts of different heights to create texture. A natural fibre from sheep that is renewable and sustainable. Wool carpets are soft and luxurious, with strong, natural fibres that resist stains, retard flames and help regulate your home’s temperature. A blend of 80% wool and 20% synthetic fibre. They offer the resilience of synthetic fibres with the luxury and appearance of wool, with improved wearing ability and reduced shedding. A new fibre with 37% renewably sourced polymer from corn sugar. Triexta fibres are extremely soft. They provide high stain, soil, wear and colourfast performance. Browse our eco+ Triexta carpets. SPF Nylon is a synthetic fibre that resists fading from the sun. Available in a wide range of colours with long lasting colourfastness and great stain resistance making it easy to clean. A synthetic fibre that is resilient and stain resistance. Nylon carpets provide durability and come in many carpet styles. Because Nylon fibres readily accept dye, they have a large colour palette. A less expensive synthetic fibre that is still soft. Polyester fibres are manufactured from man-made materials. Carpets are soft and have good colourfastness, suited best to low traffic areas. Polypropylene is a less expensive, synthetic fibre. With fibres manufactured by man-made materials, carpets are colourfast and resist most stains, usually made in loop styles. NEED ASSISTANCE WITH CHOOSING THE RIGHT CARPET FOR YOUR HOME? The appearance, texture and longevity of a carpet are largely determined by its fibre type. Carpets come in both natural and man-made fibres, each with their own properties which can greatly affect the comfort and look of your home. We can help ensure you select the carpet that is right for you and your lifestyle. Contact us today for information. The Little Do’er has been in the business of carpet flooring in Sydney for over 40 years, so when it comes to carpets, we know just about everything there is to know, which is great for our customers. As specialists in carpet and flooring in Sydney, we can help you make the right choice when it comes to choosing your carpet. We are experts in both residential and commercial carpets in Sydney and know the perfect type of carpet for your specific needs and your budget. You might not realise it, but carpet is still one of the best loved floor coverings in Sydney homes and in many commercial buildings as well. Here are a few descriptions of the different types of carpet that are available, to help you decide which is best for your property. Cut pile carpet, Sydney: These carpets have a luxurious appearance due to their deep upright pile, but do tend to show footprints and vacuum sweeps. Loop pile carpet, Sydney: These carpets have a very stylish, modern appearance that is soft and smooth and are perfect for high traffic areas, as they don’t show footprints. Carpet floor tiles, Sydney: These are perfect for very high traffic areas or areas where damage or spills can occur regularly, as each tile can be easily replaced. Wool carpet, Sydney: Naturally beautiful, 100% sustainable and eco-friendly wool carpets are naturally hypo-allergenic, fire resistant and easy to keep clean. Wool blend carpet, Sydney: Wool carpets mixed with a synthetic fibre have the durability and resilience of synthetic carpets and the beauty and luxury of wool. Nylon carpet, Sydney: Cheaper than wool or wool blend carpets, nylon is very durable, long lasting and versatile, and comes in an infinite range of patterns and colours. Polyester carpet, Sydney: Highly stain and fade resistant, cheaper than wool or nylon, these are a budget friendly option that stands up well to wear and tear. Polypropylene carpet, Sydney: This are another budget conscious option that is stain resistant and extremely resistant to fading as well. Stain resistance carpet, Sydney: Some carpet materials are naturally stain resistant and we can advise you on the best options for your needs. Our mobile showroom in Sydney can visit your home and help match your preferred style and colour of carpet and flooring in Sydney, to your furniture and home decor. We can do a free measure and quote on the spot. 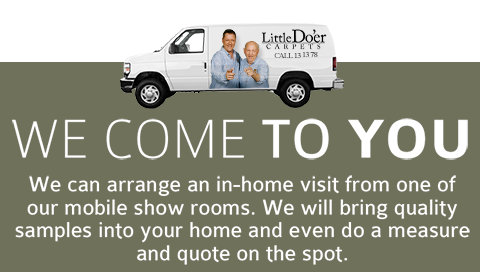 Call Little Do’er Carpets (Flooring expert contractors/installers Sydney) on 131378, email us at info@littledoer.com.au or complete our online enquiry form to make an appointment.